MEGA invites Job Applications from qualified and experienced candidates for appointment of middle-level management positions. Gujarat Metro Rail Project Recruitment Notification for Various posts. 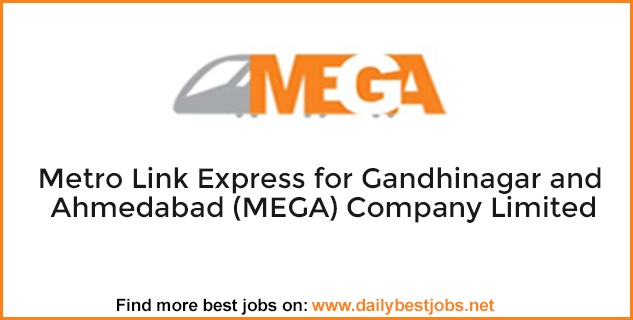 You can read all job vacancy details of Metro Link Express for Gandhinagar and Ahmedabad (MEGA) Company Limited & Apply later. Those candidates who are interested & eligible can only apply for middle-level posts. To know Job description, How to Apply, Qualification, Selection Process & other job required details. You must below Download PDF for official Job Recruitment Notification for Appointment at MEGA. Read all required Job details before applying to Metro Rail Project Recruitment 2017-2018. Know the below given official Job notification details to apply for middle-level posts. Download below Official Job Notification & Job Application Form. Total No. of Vacancies: 07 Post Vacancies. Education Qualification Requirements: Download the official job notification for Qualification. All candidates must remember this last date to Apply for Gujarat Metro Rail Project Recruitment 2017 on 23/10/2017. How to Apply Gujarat Metro Rail Project Recruitment 2017? All Interested & Eligible candidates have to read official Job notification in a prescribed format. You can download here Job Application Form. Subscribe now your email for more Jobs and like us on Facebook. Share it with your friends who eligible & interesting for Metro-Link Express for Gandhinagar and Ahmedabad Recruitment 2017.